Nvidia's graphics cards have long been pack-leaders when it comes to performance, often making them the best graphics cards around. Where AMD may offer a great value, Nvidia's flagship cards like the RTX 2080 Ti push performance to the limit. So, when you're looking for a card to spend your money on, it's worth seeing what the best Nvidia card you can get is. Whether you want to build the most powerful gaming rig possible, are looking to put together a compact Mini ITX build, or just want to get the most framer per second for your dollar, there's an Nvidia graphics card to fit the bill. We've got our rankings for the best Nvidia graphics cards in a variety of categories, so you can find the right GPU for your build. Nvidia's Turing graphics cards didn't come cheap when they first launched, but that was in part because there wasn't a mid-tier model. Now the GeForce RTX 2060 is here, and it offers a balance or price and performance. For 1080p gaming, you'll get stellar visuals and frame-rates while also having the ability to toggle on ray tracing for supported games. It can even let you jump up to 1440p or 4K, making it a viable option for high performance in eSports and high quality in AAA titles. There's no doubt that the Nvidia GeForce RTX 2080 Ti is a total pain in the budget, coming in a price higher than plenty of complete gaming rigs. But, there's also nothing else that can compete with a RTX 2080 Ti in terms of performance besides maybe a board partner's version of the RTX 2080 Ti . If you want the highest frame rates at 4K or the best looking ray-traced graphics, the RTX 2080 Ti is the way to go. That is, as long as your budget can handle it. 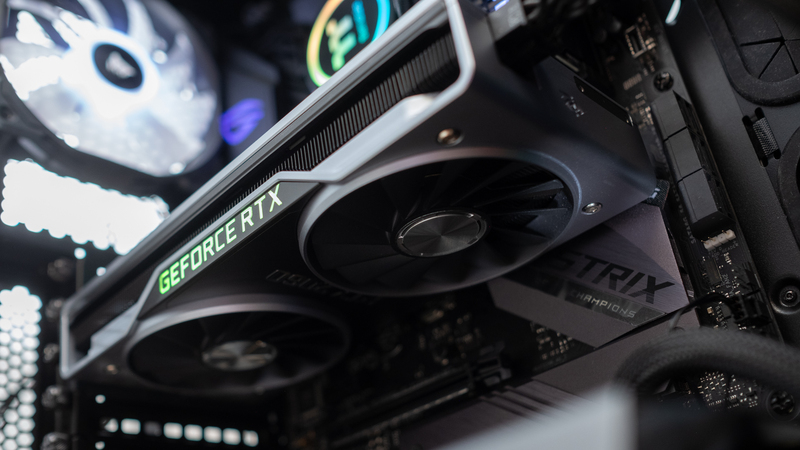 The Nvidia GeForce RTX 2070 succeeds the GTX 1070 with a hefty dose of extra power. It comes with a major markup in price, but if you're looking for a graphics card that will tackle 4K or high-FPS gaming at 1440p, the RTX 2070 is ready, and it's a good chunk cheaper than the next highest-end RTX card. The RTX 2070 can put out a staggering 120fps in Shadow of the Tomb Raider running at 1440p, so you can count on it for buttery smooth gameplay in plenty of games. Just be ready to pay the RTX tax, whether or not you plan to use ray tracing. Given how few games are using Nvidia's ray tracing and Deep Learning Super Sampling technologies, it's not necessarily the most delightful thing to see the price hike on Nvidia's RTX graphics cards. That's what makes the Nvidia GeForce GTX 1660 Ti so great. It eschews the ray tracing and DLSS to offer a focus on value that helps make it worth every penny. When it comes to card that offer the most performance per dollar, it doesn't get much better than the GTX 1660 Ti, and this PNY model offers a healthy dose of extra performance with its overclocking. You'll be able to enjoy almost any game smoothly at 1080p, and shouldn't be afraid to check out 1440p either. If you're involved in creative workloads like 3D design or video editing, you might be running into some serious VRAM needs. In those cases, it can be worth it to have a graphics card that is going to give you tons of headroom to keep information in the GPU's memory, instead of constantly needing to load it in from your storage solution. While it comes at a high price, Nvidia's Quadro RTX 6000 loads up on 24GB of GDDR6 memory while also packing plenty of performance. And, you can combine multiple cards for even more performance. High resolutions and high framerates are one thing. Nvidia's GeForce RTX 2080 can handle 4K with aplomb and keep 1440p gaming buttery smooth without the need to dial down settings. But, it can also meet the needs of VR enthusiasts. Beyond the power needed to meet the needs of VR headsets' high refresh rates, the RTX 2080 comes with the VirtualLink VR connector, meant to make connecting VR headsets that much easier. If you're trying to keep your build small so it doesn't take up a ton of space in your room, you might be looking at a Micro ATX build. And, mini graphics cards can be a major helper there, since a graphics card tends to be one of the bigger components attached to a motherboard. EVGA has a well-priced model in the RTX 2060 XC Black Gaming. It may be thicker than your typical dual-fan variant, but that extra radiator thickness helps it dissipate heat with the single fan, and its short length can help it fit in tight builds. While the higher end graphics cards get all the hype, they tend to have a worse performance-per-dollar value then budget cards. And, while AMD often hits that sweet spot, Nvidia sometimes remembers to offer value as well. That is represented nowhere better than the GTX 1660. Gigabyte offers the GeForce GTX 1660 OC 6G for an excellent budget price while still giving you a touch of overclocking, so you can enjoy 1080p or even 1440p with some tweaked settings. Best of all, you won't need to take out a mortgage to afford this card. With all the new Turing cards coming out, Pascal may be easy to forget about. But, if you're into eSports games, you're probably more concerned with getting 1080p at 120+ FPS. And, you can do that with the older Nvidia GeForce GTX 1060 no problem. For popular eSports titles, the GTX 1060 has enough power to run 1080p even at high settings and still get smooth visuals. Best of all, the prices are driven down by newer cards, so you can score a GTX 1060 at a discount. When you're trying to maximize performance for your graphics card, you might turn to liquid cooling. And, the Gigabyte's Aorus RTX 2080 TI Xtreme Waterforce 11GB comes with the card, radiator, tubing, and fans you need to get started. The serious water cooling solution allowed Gigabyte to push the RTX 2080 Ti well beyond its base specs. This model has a base clock higher than the Founders Edition's boost clock. And, to top it off, there's a little flair of RGB lighting on the radiator fans and card's metal backplate.